Make room for Canyon Bakehouse’s all new Big Slice bread. 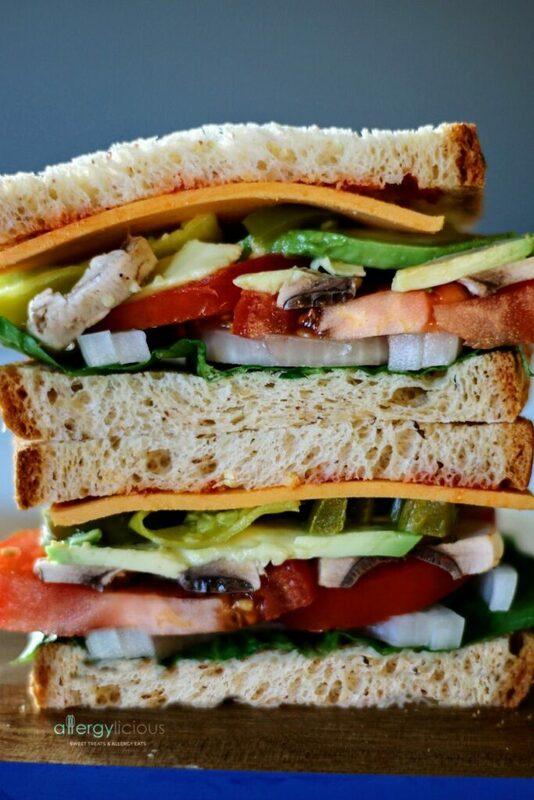 What is better than a deliciously stacked, homemade sandwich? How about being able to make it on a Heritage style, Gluten-free Wide Loaf?! That’s right, I said gluten-free :). I’m always a little skeptical before tasting packaged GF bread, probably because I have tried so many horrible tasting ones. Some taste like cardboard, others taste like nothing and most of them are simply as hard as a rock. Because of this, and the fact that I don’t actually have to eat gluten-free, I typically opt for sprouted wheat bread or simply none at all. However, I’m always looking to find an option that is free from wheat or gluten, especially for my son’s benefit. Because of that, I was thrilled when I heard about Canyon Bakehouse’s new Heritage style, Gluten-free Wide Loaf which is making its debut in stores nationwide very, very soon! Their “need-both-hands-to handle” loaf comes in Honey White and Whole Grain and are made with natural ingredients, low in fat, non-GMO and full of flavor. They not only are gluten-free but also free from dairy, peanuts, tree nuts, soy, sesame & casein (they do contain eggs). What I really loved was that these larger than average slices taste like real bread! Golden baked crust on the outside, soft chewy center in the middle and no falling apart when you pick it up! These loaves are so, so soft! Really! My husband didn’t even realize he was eating gluten-free bread and that’s a HUGE deal! Of course I had to put this bread through a few challenges. How does it toast? Beautifully! How does it freeze & defrost? Perfectly! How does it taste? Not gluten-free! How does it stack? Well…. I layered this bread with all the good stuff. Vegan cheese, Sriracha, jalapeños, pepperoncinis, avocado slices, mushrooms, tomatoes, onions and little lettuce of course. And guess what, no breaking!! No soggy middle. Just pure deliciousness! 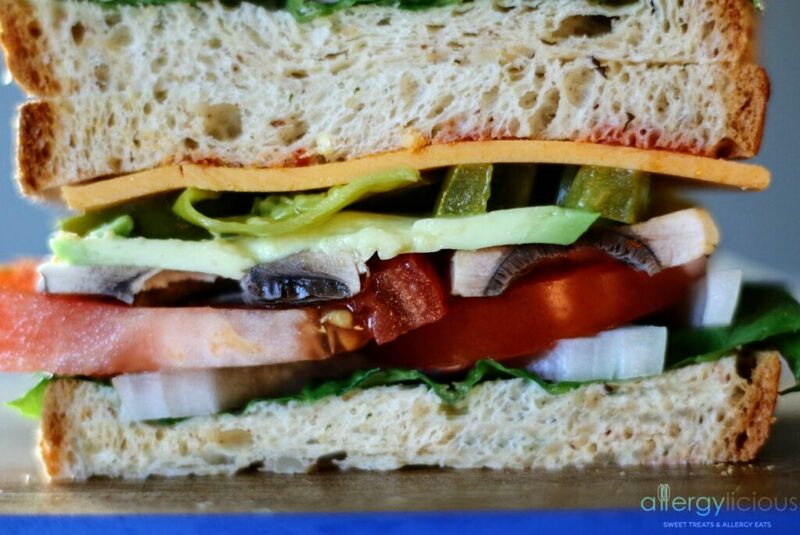 This monster of a veggie sandwich was built for sharing, which was exactly what I did! Get my recipe below for a little inspiration and pile on your own favorite toppings. Don’t be shy! This monster of a sandwich is built for sharing unless you can devour this amazingly yummy dish all by yourself. Made with Canyon Bakehouse Gluten-free, Heritage Style bread. Lay 1 slice of bread on your plate. Spread with vegan mayo, drizzle with Sriracha and a bit of olive oil. Top with remaining slice of bread, cut and serve. 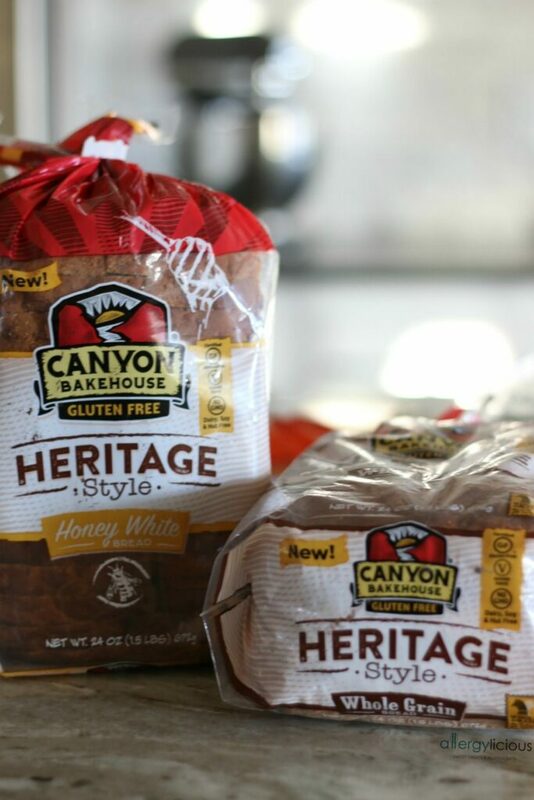 Certifications: Canyon Bakehouse is certified Gluten-free, Kosher, and 100% Whole grain. Dietary Notes: By label, Heritage Style loaves are free from dairy, nuts, soy & casein. According to their website, they use only 100% whole grains, no GMO’s and ingredients you can find in your own kitchen, such as extra virgin olive oil, organic agave syrup, quinoa and sunflower seeds. AS always, read labels in case ingredients or processing changes. Where to find it: NOW available nationwide in Target and look for it in February at your local Whole Foods & Sprouts. Heritage Style will soon be available to order online as well in case harder to find in your local stores. Website: For more product information and online coupons, go to www.canyonglutenfree.com. Always room for improvements on our GF breads! SO true Rebecca. Do you have a favorite GF bread? Now that’s a proper sandwich! Love using all real ingredients so this looks like a winner to me! Real ingredients just make it so much better, doesn’t it? Gluten free bread is always too small, i love seeing companies starting to do this! Me too! I’m also excited that is actually tastes like artisan bread. I’m pretty sure I could take this whole sandwich down just by myself! Looks delicious! I can relate to being hesitant to packaged gluten free breads. I’ve heard good things about this one and can’t wait to try it. It was really good! I was pleasantly surprised, as was my family. I think you’d love it. Canyon Bakehouse is my favorite gluten-free bread that I eat for myself (it’s not safe for my son). I buy the raisin bread ALL the time!! I’ll have to take a look for this one and try out your yummy sandwich recipe. Thanks for sharing with us. Up until we did OIT, my son couldn’t have eaten it either or we would have had to use the EPI. Now, we have to give him foods with eggs baked into them just to keep it in his system. Now I’m trying to find new foods to introduce so we just loved this bread and I’m looking forward to trying their raisin bread. Thanks for the recommendation. Wow, just look at that mound! 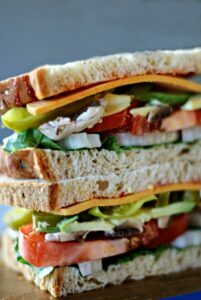 I love sandwiches piled high with veggies, and that bread is a darn good one! Me too! 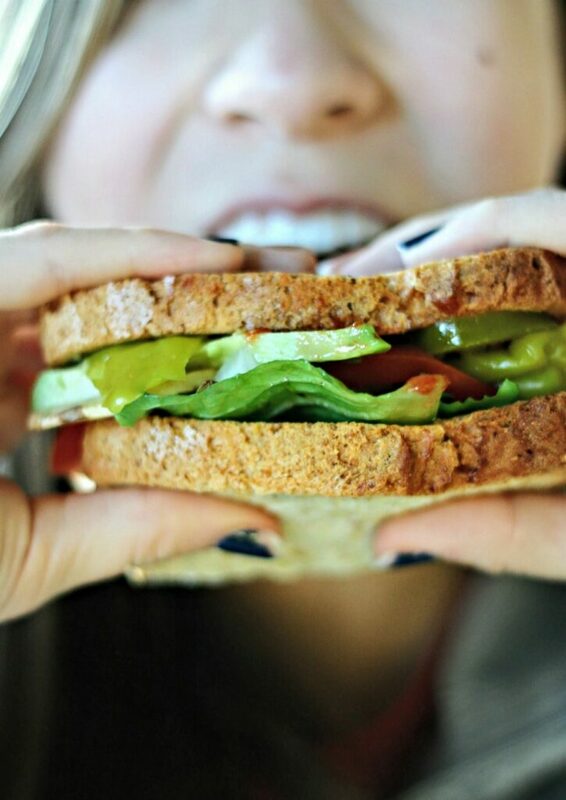 Sandwiches are always better when you need 2 hands to hold onto it! If that’s not a sandwich I don’t know what is!